Options for fluorescent grow lights were limited for many years. 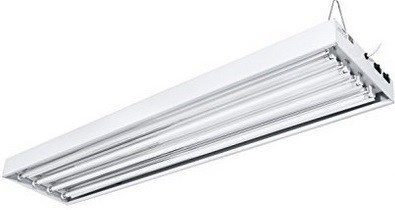 The standard 2 bulb, 4 foot long fluorescent shop light was just about your only choice. Because of the affordability of the fixtures and the huge improvements in the bulbs themselves, standard fluorescent lights are still an excellent choice. When using standard fluorescent "shop light" fixtures, choosing the right bulbs is very important to your success. For seedlings, clones, and vegetative growth, you want lots of blue light in the spectrum. Pick bulbs that say "cool" or "cool white". Also, I always try to get bulbs that say high output, or "plus". 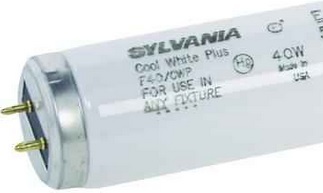 Lately I have been using Sylvania Cool White Plus (and have been very happy with their performance). With the right bulbs in place, your fluorescent shop light will provide enough light to grow healthy plants up to 10 or 12 inches tall. A single fixture like this is perfect for seedlings and clones. By using 2 or 3 fixtures above your plants, you can increase the effective light zone to around 24 inches of good light. This is what you need to do if you are growing plants vegetatively to 18 or 24 inches. Since fluorescent lights put out very little heat, you can keep the tops of the plants 1 to 4 inches from the bulbs at all times. Even if they touch the bulbs there is unlikely to be any damage. Mainly, it will just be blocking the light. This is the newest improvement to fluorescent grow light systems. The T5 system uses improved high output bulbs, like the ones I suggest using in the section above. They use several bulbs side by side, and there is an arched reflector behind each bulb. These lights are designed to support bigger plant growth. Their best use is for growing strong, healthy plants up to 24 inches tall in the vegetative state. T5 lights are a little expensive in my opinion, so I recommend sticking to standard fluorescent shop lights for your seedlings and clones. One friend who has been using T5 fluorescent grow lights exclusively has told me these lights support flowering well. However, he also told me the yield is about half what you would expect from the same size garden grown under a high pressure Sodium light of the same wattage. After gardening under fluorescent lights for a year to save money, my friend is now switching to a high pressure Sodium grow light. 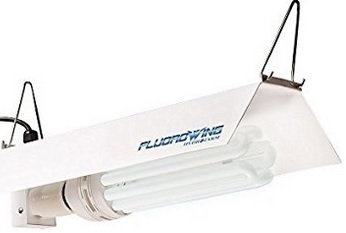 This is the latest development in fluorescent grow lights. Every inch of bulb surface is a source of extra light, and these bulbs are designed to have a maximum bulb surface in a tiny space. The designers combined this with the best high-efficiency horizontal light reflector technology to make the most of every bit of light. I have been told the performance and function is very similar to the T5 fluorescent grow lights. The price of these two systems is also about the same. I believe the T5 lights and compact fluorescent lights cost around 400 dollars. I have seen standard shop light fixtures at Sprawl-Mart for $7.95. High output bulbs are about the same (8 dollars for two). I have been convinced for a long time that you can duplicate the performance of T5 lights and compacts much less expensively. Even if it took you 5 fixtures and 5 packs of high output bulbs and you put together a 10 bulb setup, you still would have only spent about 80 dollars. All plants under grow lights (except clones) should always have an oscillating fan on them. Grow rooms, grow boxes, closets, etc. usually will also require an exhaust fan. For more information on providing fresh air for your plants and controlling the temperature in your garden, check out my exhaust fan setup page.